Letterpress printing is an amazing way to bring a simple wedding invitation to life, giving it a luxurious, high quality finish. Laura and Cody were married in July this year and commissioned me to design and print their bespoke Letterpress wedding invitations. Each invitation set included an A6 wedding invitation and A7 Rsvp card, both with printed envelopes. 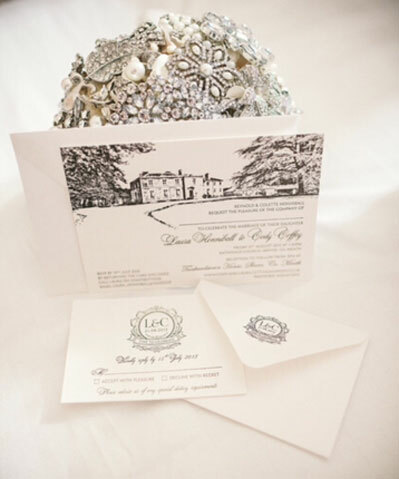 The design incorporated their own personalised crest and an illustration of the their wedding venue. Each invitation and rsvp card was printed using the Letterpress process, in black ink on to Saunders Waterford 100% cotton paper. They were a great success and looked amazing as a set. The couple went with a gorgeous simple but glamorous style which i’m sure you will love. Their beautiful wedding photos are courtesy of Chris Semple Photography.